Samsung Galaxy S10+ 128GB SM-G975F/DS. (FACTORY UNLOCKED) 6.4 8GB RAM. Prism White, Prism Black, Prism Green, Prism Blue, Canary Yellow, Flamingo Pink. No Region Lock - can be use worldwide. Brand New in Sealed Box. GSM 850 / 900 / 1800 / 1900 - SIM 1 & SIM 2. HSDPA 850 / 900 / 1700(AWS) / 1900 / 2100. LTE band 1(2100), 2(1900), 3(1800), 4(1700/2100), 5(850), 7(2600), 8(900), 12(700), 13(700), 17(700), 18(800), 19(800), 20(800), 25(1900), 26(850), 28(700), 32(1500), 38(2600), 39(1900), 40(2300), 41(2500), 66(1700/2100). 157.6 x 74.1 x 7.8 mm (6.20 x 2.92 x 0.31 in). 175 g / 198 g (ceramic) (6.17 oz). Front/back glass (Gorilla Glass 6), aluminum frame. Hybrid Dual SIM (Nano-SIM, dual stand-by). IP68 dust/water proof (up to 1.5m for 30 mins). Dynamic AMOLED capacitive touchscreen, 16M colors. 6.4 inches, 102.2 cm. 1440 x 3040 pixels, 19:9 ratio (526 ppi density). Android 9.0 (Pie); One UI. Exynos 9820 Octa (8 nm). Octa-core (2x2.7 GHz Mongoose M4 & 2x2.3 GHz Cortex-A75 & 4x1.9 GHz Cortex-A55). MicroSD, up to 512 GB (uses SIM 2 slot) - dual SIM model only. 128 GB, 8 GB RAM. 12 MP, f/1.5-2.4, 26mm (wide), 1/2.55", 1.4µm, Dual Pixel PDAF, OIS 12 MP, f/2.4, 52mm (telephoto), 1/3.6", 1.0µm, AF, OIS, 2x optical zoom 16 MP, f/2.2, 12mm (ultrawide). 10 MP, f/1.9, Dual Pixel PDAF 8 MP, f/2.2, depth sensor. 32-bit/384kHz audio - Active noise cancellation with dedicated mic - Dolby Atmos/AKG sound. Wi-Fi 802.11 a/b/g/n/ac/ax, dual-band, Wi-Fi Direct, hotspot. 5.0, A2DP, LE, aptX. Yes, with A-GPS, GLONASS, BDS, GALILEO. FM radio (USA & Canada only). 3.1, Type-C 1.0 reversible connector. Fingerprint (under display), accelerometer, gyro, proximity, compass, barometer, heart rate, SpO2. ANT+ - Bixby natural language commands and dictation - Samsung DeX (desktop experience support). Non-removable Li-Ion 4100 mAh battery. What's in the box. USB Connector (C to A). Our items are International and work with GSM networks only. Do not work with CDMA carriers like Verizon, Sprint, Boost... It helps our business greatly. If you feel that you can't give it to us- Please let us know what we can do to be better. This way we will know how to improve our customer service. And Overseas as Zambia, Kazakhstan... If so, we may ask you to pay the difference. Any other country in the world. Address cannot be changed at any time. Misused or abused merchandise will not be accounted as defective. This policy may be modified or changed without any further notice. 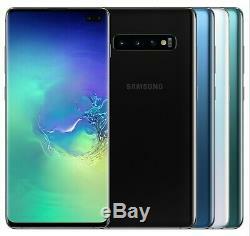 The item "Samsung Galaxy S10+ Plus 128GB SM-G975F/DS Dual (FACTORY UNLOCKED) 6.4 8GB RAM" is in sale since Saturday, February 16, 2019. This item is in the category "Cell Phones & Accessories\Cell Phones & Smartphones". The seller is "never-msrp" and is located in Houston, Texas.